Our memory of summer has started to fade now that shorter days, longer nights, and cooler temps are here to stay. Take advantage of the season and get inspired with all it has to offer from apple to pumpkin picking, leaf peeping and weekends at home with family and friends. With the changing of the seasons comes a change in how we cook as we switch to comfort foods, soups, casseroles and more. 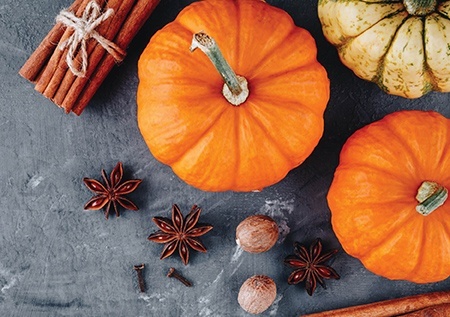 Here are some of our fall inspired recipes that will keep you warm throughout the season but feeling good knowing you haven’t strayed from the Zone. Baked oatmeal is perfect for anyone looking for a quick and satisfying meal. Put in a food storage container, then grab and go on your way to work. Mix the dry ingredients in one bowl except for fruit. Mix the wet ingredients in another bowl. Add the wet to the dry until well incorporated. Fold in strawberries and almonds. Lightly spray a 9-by-9-inch pan with nonstick cooking spray. Place mixture into pan. Bake about 30 minutes. Test the center with a toothpick. The pumpkin in this recipe is subtle and offset with a mild heat from the chili beans and chili powder. If you like a little more heat consider adding some jalapeno. This is a great recipe if you want a fix it and forget it meal, but don’t want to have to wait the whole day. Start it after breakfast for an easy lunch or early afternoon in time for dinner. In a medium skillet, brown meat, stirring often, until crumbly and no longer pink, about 10 minutes. Drain and discard any fat. Transfer ground beef to a slow cooker and stir in onions, diced tomatoes, pumpkin, chili beans, black beans, pumpkin pie spice, chili powder and jalapeno if desired. Set cooker to low, cover, and cook at least 3 hours. To round out your Zone meal completely you need a little more carbohydrate. Do something easy that can be prepared in no time like a side of sautéed broccoli or a colorful non-starchy vegetable of your choosing. Add the broccoli, seasonings of your liking to taste and toss with the olive oil and garlic. Once the broccoli turns bright green and becomes tender remove from heat and serve. Apple sauce and pumpkin spice turn this Zone Pasta Orzo recipe into a fragrant warm breakfast, perfect for any morning. If you cook the pasta and oats the night before it can be ready in less than 5 minutes. Prepare Zone PastaRx Orzo and steel cut oats according to package directions the night before. Heat the cooked orzo with applesauce in the microwave. Stir in pumpkin pie spice, stevia and extra virgin olive oil. Top with yogurt and pecans. This is a great side to have on hand when you want a little crunch or a great substitute for croutons on salad. Each serving is 9 grams of carbohydrate and 1.5 grams of fat so you’ll need to add an ounce of lean protein to make it Zone complete. In a small bowl, mix together pumpkin spice, allspice, turmeric and salt. Stir well. Pour the spice blend over the chickpeas and mix until everything is well coated.